Bear hug lodge was great!! The location was great and the deer are amazing 10-15 right out side screen porch. We will definitely be back! Thank you for hosting us and for being so quick to reply to the questions we had upon checking in. Cute, comfortable 2 bedroom cabin. We enjoyed our weekend stay when we came up for an event but wish we had more time to enjoy the peaceful environment. Would stay there again. Beautiful cabin located right on the Cartacay River. Roads are a little rough but other than that everything else was very nice. We really enjoyed our stay.The cabin is very nice and it's surroundings are quite beautiful. I would definitely recommend to a friend or family member. We enjoyed or short vacation. The pools and putt putt were a hit for the kids. Enjoyed fishing and watching the deer. Love the way everything was handled. Will use CabiNation again. Great place! Chris was an excellent host! We will be back! We loved it :) Perfect for bringing dogs because of the fenced in yard and its so peaceful. Loved the cabin it was the perfect get away!! It was at a great location not far from town, they have 2 fire pits outside with one being down by the river where I had caught some trout and grilled them over the fire. The hot tub was a nice place to relax.the house was very cozy and they have plenty of board games upstairs in the loft to enjoy with friends and family. I definitely would recommend to others to visit! Staff was very friendly, responsive, and professional. Great cabin if you're ready to unplug, settle in, and just enjoy the mountains. Wonderful quiet location with cathartic sound of dancing creek and beautiful walks through woods. Creative and artsy cabin is comfortable and inviting. We thoroughly enjoyed our stay! Such a neat cabin with so much character. Our absolute favorite cabin ever. We love the seclusion and the outdoor firepit is amazing! We had an awesome time and enjoyed having 0 cell coverage. We were able to disconnect and enjoy each other. The riding trails in the National Forest are wonderful! We had such a great weekend at the Bear Hug Lodge! So relaxing! The cabin was just as pictured and we loved watching the deer wander by at dusk. This is a great getaway for those who are looking for a comfortable location to relax with your favorite people and pups. The outdoor areas are the perfect settings for unwinding and good conversation next to a fire. It's a 15 minute drive to the local Starbucks and Chick-fil-A for your convenience. Wonderful place to stay in Ellijay. Nice, quiet and clean; it was the perfect getaway for my family (to include our doggies). Thank you again for letting us stay and being a wonderful host. We certainly enjoyed our visit. Fantastic Cabin. Wonderful, cute, great location and extremely relaxing. Lovely touches like the fire pit and hot tub. We will definitely be back. Great cabin up in the mountains. You'll enjoy it! Perfect for our weekend get a way. The cabin was clean and the host provided all the essentials we needed for the weekend. Would definitely book again!! 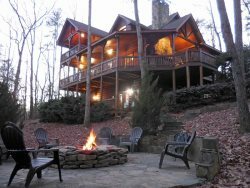 Amazing cabin just an hour 30 minutes away from Atlanta. Me and my family had a very relaxing and much needed weekend. The owner has put a lot of love and attention into this cabin. I would recommend this cabin to anyone looking to visit the area.